About two years ago, I was just getting the hang of things in my first librarian position in a new area for me. The librarian before me established a storytime for every Saturday that was mostly attended by one or two families every other week. Despite having low attendance, it was a well-loved program for those who did participate, and very often the families that came were immigrants still learning English. We had a Chinese family, but mostly we had a few Latino families who rotated coming with their school-age kids. A couple months into my job, I was stopped while I was packing up after a storytime and headed back into the library. The man identified himself as a city official and then commented that we seemed to have a lot of Mexicans coming to the library. He made some further uncomfortable remarks to me that made me question how much I wanted to stay in the area if a public servant could feel confident saying those things to me. I powered through, but I’ve never forgotten that moment. It was the first time I’d encountered outspoken racism and the first time someone had tried to pressure me for it. As a new joint chief for Storytime Underground, I’ve had the benefit of networking with six other amazing professional women, two of whom (Mary and Holly) are fluent Spanish speakers. They’ve helped me learn about building more inclusive programs and because of them, I decided to include activities in Spanish in every storytime, even when there are no Spanish-speaking families present. As I build relationships with families more and more unlike myself, I find myself wanting the challenge of diversity in my professional life every day. So when Día offered mini-grants to celebrate their 20th anniversary, I went for it. My library system has never celebrated Día de los Niños before this year, and in fact, we’ve really only ever done one other big program targeting Latino families. I wanted to see us step up and show our commitment to this community by investing in a festival to blow everyone’s minds. When applying for the grant, I made a rookie mistake. I thought about what our library system needed rather than what the community wanted and what resources were available. We are in the beginning stages of offering more services for babies and toddlers and I wanted something that could help the Latino community discover these new services. That’s not really a terrible motivation, but I learned while planning this event that starting with what you want is not the best way to go. Initially my plan was to host a Community Baby Festival, but after the grant application was accepted and I started building the event, it evolved into something a little different, but better. More on this to come, but here’s a sneak peek. It’s time for imitating sounds! Just like last week’s post on walking with support, this is another one of those posts that almost seems silly to me because it’s so easy to observe and support in storytime. Anyone who’s done a baby storytime knows how much babies love repeating animal sounds and sounds from things that go, but why is it important to storytime and child development? At this age, babies are really ramping up the building blocks of language and communication. They’re going from making less intelligible sounds like cooing and gurgling to making intentional ones that get our attention. They’re recognizing that some sounds create a favorable reaction and they can remember what sound to make to cause an adult to, say, pick them up or feed them. They’re also beginning to experiment with the way sentences work. You might hear them raise their voices while babbling like they’re asking a question or you might hear them grunt the sounds when they’re grumpy. It’s also a really great time for practicing the way that sentences sound. Books that ask questions in the text and give answers are outstanding for this. 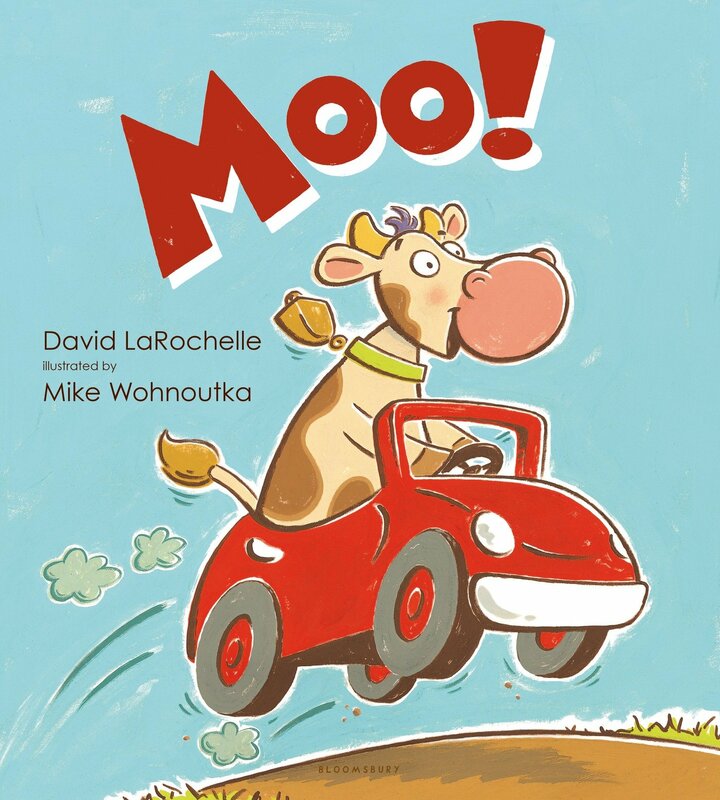 Also, can I just recommend Moo by David LaRochelle 100 times?! It is absolutely perfect for supporting imitation because it’s just a simple sound that all babies can make, but said in lots of different ways. Plus! It’s guaranteed to make your adults chuckle. When babies are babbling to you or even beginning to say their first words, it’s also really important to use it as an opportunity to model scaffolding in our conversations. I like to do this during playtime most of all. When babies wander over to me and babble, I like to respond with a short reply. “Yes, the blue ball goes, ‘bounce, bounce. '” It takes some practice, but I always try to think of a word to end my sentence that can stick with them. Babies want to know names for things and they really like to speak the sounds it makes, so I often focus on that. Sometimes a baby or two will really get a kick out of saying their name, too. I often reply with what toys are near or what they are doing. Me: Edmund is walking so fast, fast, fast. Me: Yes, Ava is making a tower! I’ve seen parents really pick up on this practice with very little coaching from me and it can help tremendously with speech development. This is a really magical time when you can see first words appearing and my observation has been that adults really start to swell with pride and become even more involved in the learning process after that. The month of March was hectic for me at work. I had so many programs and collaborations going on that I didn’t get a whole of time to plan and prepare for any of them. Never good! Luckily I planned this program to be pretty simple. It was Spring Break, and that meant families would be looking for easy ways to spend quality time together. Since I was going for easy for me, too, I decided to make it a family movie day with some activities to extend on the experience. I showed The Good Dinosaur, which was a new release, and created a few stations and activities to explore before the movie. Here are my stations. I found some dinosaur figures in the party favor section of my local Wal-Mart and bought a few packs. I buried each pack in a bowl of chocolate pudding with a marshmallow surface. There were wipes at each bowl to allow kids to wipe off the dinos before they took them to a table to identify them. For this station, kids donned a mask, picked up their search sheet, and went searching around the library for those dinosaurs. Since this program was in the council chambers that’s connected to this library, the safari was a tricky way to get them into the library to look around and count them in our door count. I set up a few tables in the room and draped them with black tablecloths to create “caves.” I explained that our movie would have a cave man and that humans used to make paintings as a way to tell stories. I asked them to create their own stories inside the caves. These activities took around 20 minutes for most families to complete and when I saw that everyone was finishing up, I started our movie. As the opening credits were playing, I pointed out exits and explained that no one’s feelings would be hurt should anyone choose to leave early. There were some preschoolers in my crowd and I said this to make them feel a little more empowered if (and when) those children got bored and disruptive. The Good Dinosaur is not the most exciting kids’ movie I’ve ever seen. I watched it the weekend before the program and considered choosing another movie instead, but thought that since I’d advertised for this one already, I’d better stick with it. My advice would be to pass on this one as a program pick. I’m finally back with some more content in my storytime and child development series. Hooray! I’ve loved thinking more deeply about how my practices in storytime not only build on early literacy, but the development of the whole child, too. Thinking about stages in more specific terms has made me realize that there are all kinds of ways that I can adapt any storytime to be more beneficial to the ages present. Today I’m leaving the 4-8 months stage and moving into 8-12 months and I’m starting with one of the major, easily recognizable developments: walking with support. By eight months, most children will be sitting up independently and beginning to walk around by pulling themselves up on higher surfaces like chairs and tables or a pair of helpful hands. It takes a lot of confidence to walk totally independently and practicing with support is sort of like riding a bicycle with training wheels. Working in a time to walk during storytime can be a fun way to work out wiggles that even babies can get AND help build that confidence. In my storytimes, I often pause between my two books or after my second book to do…A BABY PARADE. What is that? Well, basically I give all the families a scarf and I start bopping around the room to music. Adults with children who can walk might walk with their kids or stand and dance together. Where children need support, parents might help them stand and walk by holding their hands. With littler ones, adults can bounce them in their laps or standing with them on a hip and singing. To encourage connection to music and rhythm which are very beneficial as early math concepts and even in fostering a sense of community and empathy. To introduce new vocabulary through singing and listening to the words. To build those motor skills and confidence with the movements. For little ones who love to dance, it supports creativity. For this age, I like to pick music that parents will like instead of picking music intended just for children. I think it’s a great way to show adults that everything is an opportunity to help their baby grow and they can enjoy it at the same time. All of these have a strong bouncing or swaying rhythm and most are really recognizable to the adults, so they like to sing them. This is a really cute, fun part of my baby storytimes and adults love using it as a time to connect to each other, too. Give it a try!